Samsung tops the list in 2012 with Galaxy S III, a satirical campaign mocking Apple and its fans. In fact, not only does Samsung nab the top spot on the list with 71 million views, which is 17 million views more than the runner up, it also grabs three other spots on the list, including number three, four, and eight. 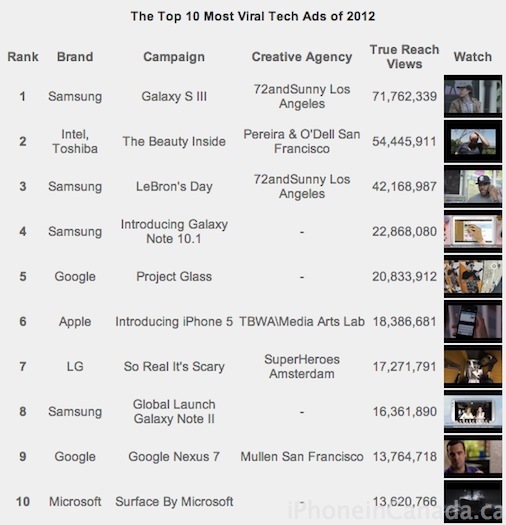 The only Apple ad to make the top 10 list was their video introducing the iPhone 5. The Samsung campaigns are clever and extensive as new commercials are seemingly released each week. Earlier data revealed Samsung spends more money on marketing than Apple, Microsoft, Dell, HP–and even Coca Cola. What do you think? Has Apple lost some of its video magic or has its competitors stepped up their game?